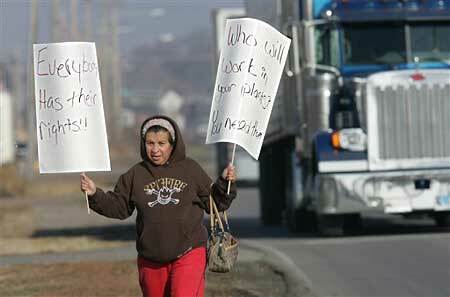 UFCW Should Shut Down Meatpackers Nationwide! DECEMBER 13 – Yesterday morning, federal agents from the Immigration and Customs Enforcement (ICE) division of the Department of Homeland Security swooped down on Swift & Co. meat packing plants in six Midwest and Mountain states. Almost 1,300 were arrested in the workplace raids. 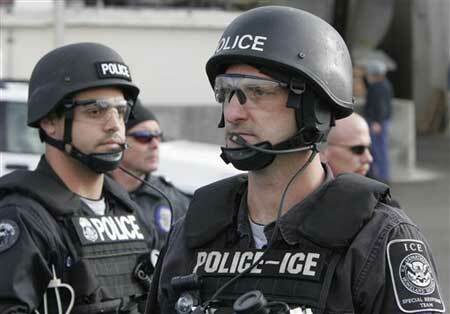 ICE officials bragged that they were the largest-ever in U.S. history. This set off shock waves that are spreading across the country. In Gestapo-like action, black-uniformed ICE cops stormed the packinghouses brandishing military weapons, terrorizing workers. Instead of using cattle cars like the Nazis, buses with whited-out windows lined up to haul immigrant workers to concentration camps called “detention centers” in antiseptic ICE-talk. 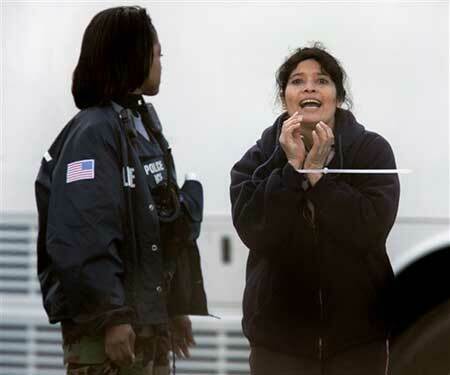 Hundreds of enraged and anguished family members rushed to the plants, bringing green cards, crying out for their relatives and chanting against the hated immigration (migra) police. Cordons of riot cops stopped them from blocking the buses. As they were shoved onto deportation buses, anguished moms in plastic cuffs screamed out for someone in the crowd to pick up their children from school. In Worthington, Minnesota a bus driver left several children at a church center because no one was home to receive them. If the workers are deported, as the government intends to do, some of these children could never see their parents again. A government that could stage such an atrocity is a criminal regime. George Bush & Co. are baby-snatchers, tearing children from their homes and banishing their parents. These raids are an attack on the entire workers movement. Unions across the country should mobilize to protest this heinous outrage. The United Food and Commercial Workers Union (UFCW), which represents 10,000 workers at five of the six Swift packing plants raided, denounced ICE for violating workers’ rights and “criminalizing people for going to work.” But it’s not enough to send union lawyers to represent the arrested workers (they were refused access) and ask the courts for an injunction (which will be turned down), as the union has done. The UFCW should immediately shut down every unionized packing plant in the country in protest. If the union struck nationwide in defense of immigrants, workers would pour into their ranks, setting off the biggest-ever organizing drive in the industry. It would also strike a powerful blow against the anti-immigrant hysteria that is being whipped up by both parties of the racist ruling class, Republicans and Democrats. The capitalists exploit immigrant labor, and in order to pile up superprofits from low-wage labor, they deny modern wage slaves legal rights. A woman standing along the highway outside the Grand Island, Nebraska plant held up two hastily scrawled signs: “Everyone Has Their Rights! !” and “Who Will Work In Your Plants? You Need Them.” She’s so right. The government calls immigrants who lack legal papers “illegal aliens,” as if they were creatures from outer space. Xenophobic (anti-foreigner) bigots call for mass deportations. But the fact is that even this reactionary regime can’t arrest and deport all or a significant portion of undocumented workers. The U.S. economy would collapse. By official estimates there are more than 12 million undocumented immigrants in the United States, overwhelmingly workers. The real number is probably much higher. Whole industries depend heavily on immigrant labor, including cleaning, construction, landscaping, food preparation and taxis. They are concentrated in the lowest-paid and most dangerous jobs. And nowhere more so than in meatpacking, where up to three-quarters of all workers are immigrants. The injury and illness rate in meatpacking is four times the rate for all industry. In Grand Island, Nebraska, federal agents surrounded the plant to prevent anyone from escaping. Out front, a woman held up a sign saying “It’s not fair. 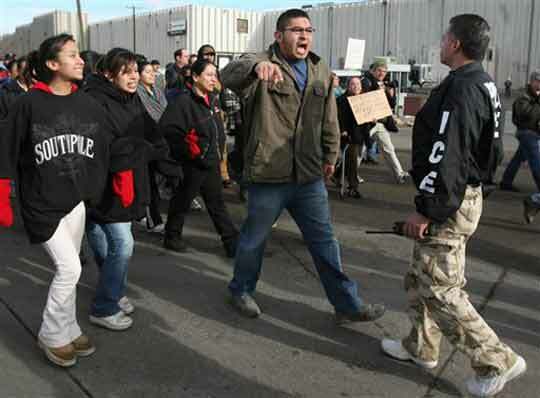 What about the kids?” In Greeley, Colorado, where some 200 were arrested, a young girl cried, “I don’t understand why they want to take my dad. He worked [here] for seven years.” Out in front along the highway, a crowd alternated between chanting, “¡Raza sí, migra no!” crying and praying. Such an abomination is no surprise from a regime that engages in wholesale torture, from Abu Ghraib to Guantánamo, as it destroys Iraq and seeks to subjugate the world. Imperialist war is always accompanied by racist repression here. The government says it is enforcing draconian immigration laws as part of “war on terror.” In reality, these raids serve to terrorize the domestic population. It claims it is defending victims of “identity theft.” Yet undocumented workers are neither terrorists nor thieves. They pay billions of dollars into Social Security funds they can never collect from. Last spring, millions marched demanding legalization for immigrants. On May Day, Swift Packing plants shut down as workers held a “day without immigrants.” Meanwhile, right-wing immigrant bashers have set up vigilante squads like the Minutemen, staging manhunts along the border like modern-day slave catchers. While many liberals and reformists call for “amnesty,” as if immigrant workers had committed some crime, the Internationalist Group fights for full citizenship rights for all immigrants, documented or undocumented. And we call for aggressive union defense of immigrants against racist attacks. The UFCW has called for “comprehensive immigration reform” and “a legalization process for the millions of immigrant workers already contributing to our economy and society.” But this won’t protect thousands of its union members facing the migra cops right now. Class-struggle unionists call on labor to oppose all documentation checks and to mobilize against immigration raids. Thousands of union members massed at plant entrances ready to take care of business are what’s called for when the feds’ deportation squads show up. The fight for immigrant rights must be waged against the partner parties of American capitalism. In Minnesota, Republican governor Tim Pawlenty crowd, “It's good to see that Immigration and Customs Enforcement is proactive.” But Democrats are no friends of immigrant workers either. The laws they are being deported under and the Basic Pilot program used to check IDs were set up by the Clinton administration. Only a class-struggle workers party fighting for a workers government can win full rights for immigrant workers.